Redpath was born in Galashiels and studied at Edinburgh College of Art. In 1920 she married and moved to France, devoting much of the next fourteen years to her family and doing little painting. In the mid-1930s she returned to Scotland, settling in Hawick in the Borders. Redpath admired the French Post-Impressionist artists, such as Van Gogh and Gauguin, and also Matisse. From the 1950s, she became well known in the Scottish art world, specialising in landscapes, church interiors and still lifes painted in rich colours. Her work from the late 1950s responds to Abstract Expressionism in the free and expressive handling of paint. Our Sponsors this month are Humblebeads, Big Bead Little Bead and Beady Eyed Bunny. 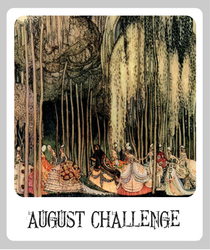 • The Monthly Challenge Recap with Blog Tour will be posted on August 30th. Please add the tag or title AUG ABS to your photos. Include a short description, who created the art beads and a link to your blog, if you have one. Deadline is August 31st. Photos are approved by our moderators, if a photo hasn't followed the guidelines it will not be approved. You may upload 2 photos a day.